Its sunday night and I am currently watching my favorite episode of Anthony Bourdains show “No Reservations”. This certain episode is my favorite because it is about London and Edinburgh..I love London..everything about it..Its also the first episode of “No Reservations” I ever saw. This episode introduced me to my favorite chef Marco Pierre White, and also introduced me to food that I had never even thought of eating for example bone marrow on toast with sea salt. Before watching “No Reservations” I had always seen the commercials and just thought Anthony Bourdain a very tall, tan, old man who was sort of weird-looking, Now when I see the commercials I smile and laugh because I love Mr. Bourdain. He doesn’t hold back…at all. Anthony Bourdain says whatever pops in to his head and he doesn’t care how it will sound which makes the show completely hilarious! In one episode he was getting his hair cut on the streets and he told the barber not too short but the translation didn’t quite get through and after seeing the final result Mr. Bourdain said he looked as if he was about to get a lobotomy. Where ever he goes, no matter what happens…you laugh…the very first episode ever filmed for the show took place in paris and there is the funniest scene where Tony is tired and cold and he’s just standing there walking in a circle going “See Tony, see Tony confused, see Tony standing here”. I can’t find a clip online..but trust me it’s rather hilarious and I never get sick of seeing it. On another episode he’s sitting in a resteraunt in Germany I believe or a country near Germany where they speak german and after the waitress takes his order he says “danke” then looks at the camera and like an excited little child goes “danke means thank you in german” and just the way he says it makes you laugh your bum off. Later in the episode they go to an unknown vineyard and after interviewing the owner and tasting and then raving over the food Tony looks at the camera and says “yeah we just ruined this place” because it will soon become a top tourist destination. 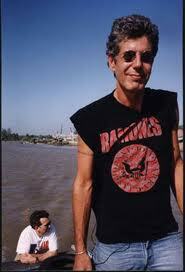 Bourdain also has an amazing taste in music..its fact. His favorite band is the Ramones! he sometimes wears a band t-shirt on the show and he even hangs out with Marky Ramone!! He also hangs out with Ted Nugent people!! and he’s so close with him that he calls him Uncle Ted! Label me impressed and jealous! Anthony Bourdain is just amazing, he will state his true and honest opinion on anything and he wont give a damn what you think about it, and if he doesn’t like the food he’s been given…well…he wont lie to you just because he’s on tv. In plain, I love Anthony Bourdain because he’s: honest, funny, entertaining and he’s not afraid to try new things. His show may not be for everyone but those who love his show are true fans who will stand by him till the end. :). Thank you for reading and I hope you all have an amazing 4th of July (if you live in the states that is) if you don’t have an awesome Monday! !